(Phys.org)—A team of researchers from the U.K., Thailand and Singapore has discovered that long-tailed macaques living in southern Thailand have learned to crack open oil palm nuts using rocks in just 13 years. The group reports on their observations and what they believe the observed behavior suggests about the evolution of tool use in primates in their paper published in the International Journal of Primatology. There are a lot of animals besides humans that have learned to use tools, but only three have been observed using stones: chimpanzees, capuchins and macaques. In this new effort, the researchers were studying macaques that live in southern Thailand. Prior research and anecdotal evidence had found that they use stones to smash shellfish for consumption. But now, it appears the monkeys have applied what they learned with the shellfish to a different source of food. The researchers report that as part of their study of the monkeys, they followed them on inland treks. At one point, they wound up on an abandoned oil palm plantation. There, they found evidence of someone using stones to pound open oil palm nuts. To find out which creatures might be involved, they set up camera traps near the evidence. Reviewing the video, they witnessed several of the macaques approach a flat stone (used as an anvil), lay down a single nut and then smash it with a stone. Each finished by picking out the edible parts within and consuming them. The team reports that the oil palms have only been in the area for 13 years, suggesting that the monkeys learned to crack the nuts over the same period of time. The researchers plan to continue with their research, curious about how the transfer of knowledge to a new site and application came about. They plan to look for older evidence of such use in more remote locations. They suggest they might even find an evolution of the types of tools used by the monkeys, perhaps offering a glimpse of the process by which our ancestors accomplished the same feat. Anthropogenic disturbances have a detrimental impact on the natural world; the vast expansion of palm oil monocultures is one of the most significant agricultural influences. Primates worldwide consequently have been affected by the loss of their natural ecosystems. Long-tailed macaques (Macaca fascilularis) in Southern Thailand have, however, learned to exploit oil palm nuts using stone tools. Using camera traps, we captured the stone tool behavior of one macaque group in Ao Phang-Nga National Park. Line transects placed throughout an abandoned oil palm plantation confirmed a high abundance of nut cracking sites. Long-tailed macaques previously have been observed using stone tools to harvest shellfish along the coasts of Thailand and Myanmar. The novel nut processing behavior indicates the successful transfer of existing lithic technology to a new food source. 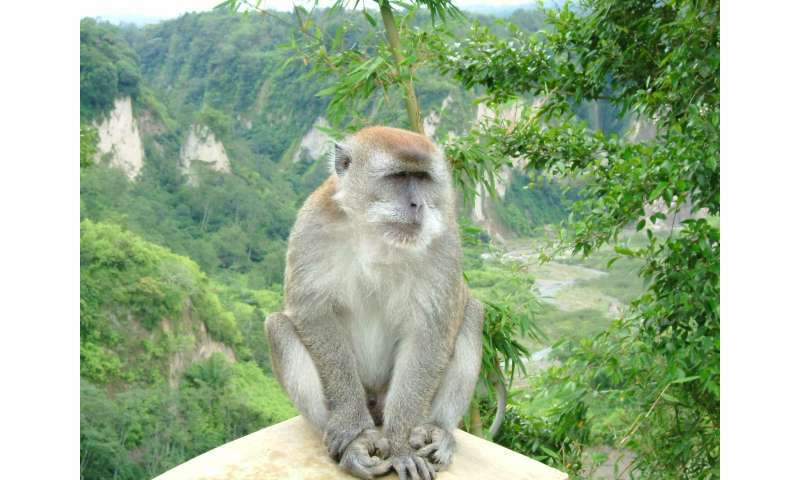 Such behavioral plasticity has been suggested to underlie cultural behavior in animals, suggesting that long-tailed macaques have potential to exhibit cultural tendencies. The use of tools to process oil palm nuts across multiple primate species allows direct comparisons between stone tool using nonhuman primates living in anthropogenic environments.